What the hell is a dry cappuccino, Ellie. The barista looked at me questioningly, probably wondering if I had entered some sort of midlife coffee crisis. You see, I've been going to the same cafe everyday for a few too many months now, and up until now, I've never strayed past the usual. She kindly obliged to my request of said "dry cappuccino." 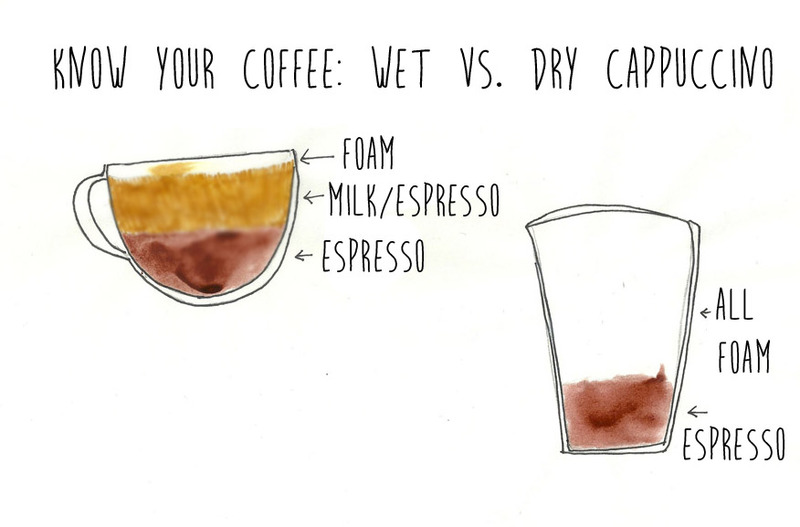 So what exactly is the difference between a wet cappuccino and a dry cappuccino? Well, a traditional wet cappuccino is only meant to be 6oz-8oz in size and is stacked (from bottom up) with espresso, followed by a milk/espresso mix and topped off with a bit of foam. An American dry cappuccino is a bit different: it’s made up of espresso and “dry foam.” Picture a small part of espresso, and a large part of foam. Tip: if you're into a sweater cappuccino, the dry style probably isn't for you. To achieve the "dry foam," the milk must be overheated, and therefore loses its sweetness.